1. Make chocolates! Melt white chocolate in a medium sauce pan over low heat just until about 1/2 is melted. Remove from heat and stir a few times until all is melted. Pour into the silicon molds and place in refrigerator to solidify. 2. Coffee syrup: Combine coffee and sugar in a small sauce pan over medium-low heat until sugar is dissolved. Set aside to cool, then transfer to fridge until ready to use. 3. Make Swiss roll! Preheat the oven to 375 F / 190 C. Line the base of a 10 by 15-inches Swiss roll or jelly roll pan with greaseproof or parchment paper. Brush the base and sides of the pan with melted butter, and dust with flour. In bowl of stand mixer, whisk the eggs, and sugar together, until light and fluffy, and then add the water, and vanilla extract. Sift in the flour, about a third at a time, and using a large metal spoon, fold it into the egg mixture. Pour the mixture gently into the prepared pan, reserving 1 cup of batter, and bake in the oven until the center of the cake is slightly springy and the edges have shrunk a little from the sides of the tin, about 12 to 15 minutes. Spread out a piece of parchment paper on a work surface and sprinkle evenly with caster sugar. Turn pan onto the sugared parchment paper, and then carefully remove the tin and parchment paper from the bottom of the cake. Cover with tea towel. Place the remaining batter in pan and bake another 10min, or until light brown. Once cooled, run through food processor to create “sand” like texture for presentation. 4. Make filling! Slowly mix mascarpone, sugar, and cinnamon in a large bowl until combined. Beat heavy cream in another bowl with whisk attachment at medium speed until it just holds stiff peaks. Fold whipped cream into mascarpone mixture. Set in fridge until ready to use. 5. Make buttercream! In a saucepan bring about 2 inches of water to a simmer. In a stainless steel bowl (preferably of a stand mixer), whisk together granulated sugar, egg whites, and salt. Place over simmering water and continue to whisk until hot to the touch - 3-5 minutes. Put bowl back on stand mixer with whisk attachment and beat for 5-7 minutes, or until very thick and stiff. Add in 1 tbsp butter at a time, until buttercream is satiny and smooth. Add in espresso until fully incorporated. Set buttercream aside until needed. 6. Make ganache! White buttercream is going, heat cream in a small saucepan over low heat until hot to the touch. Pour over chocolate and let sit for 3-5 minutes, or until the chocolate is melting. Whisk together quickly until a smooth ganache forms. Transfer to a piping bag to prepare for decorations. 7. Time to assemble! 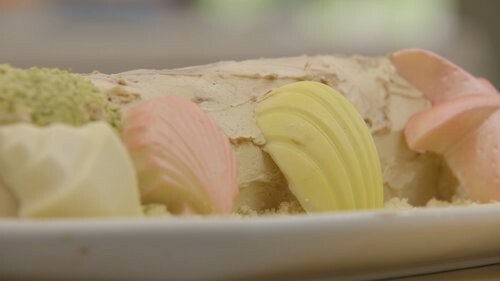 Carefully use a pastry brush to cover the top layer of Swiss roll with coffee syrup. Then spread the mascarpone mixture on top. Carefully roll up cake using parchment paper as a guide and tool. Spread buttercream all over the cake, and try to make as smooth as possible. Decorate with ganache, making “driftwood elements”. 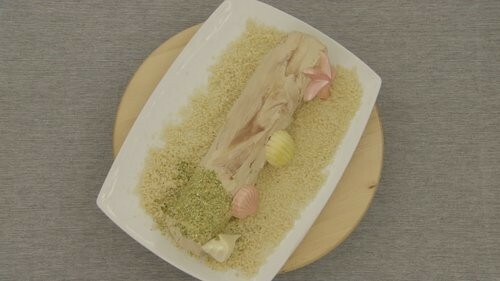 Decorate the serving platter with the graham cracker crumbs to mimic sand, and place the log on top. Place log in fridge to set while making decorations. 8. Remove chocolate from molds. Powder dust different colors that are “beach themed”. Set aside to dry. Run pistachios through a food processor until almost powder-like. Use as decoration “moss”. 9. Remove log from fridge, decorate with remaining items. Voila! A driftwood Yule log!